Blank planchets are the metal discs that would normally be struck into coins. After being punched out from a long metal strip, the discs are then fed into a machine which rolls the outer edge to produce a slightly raised edge. These are referred to as Type II planchets, ready to be struck into coins. Occasionally, a blank planchet misses getting struck and still gets into a bag of coins ready for distribution. As coins are being struck, the blank planchets are automatically fed into the coin press, where they should be perfectly centered between on the dies. 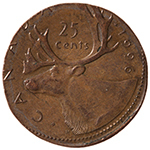 If a planchet lies partially outside of the dies during the striking, it will receive an off-center strike, leaving a part of the planchet blank with the design extending off the edge of the coin. Each coin struck off center is unique. Broadstrike errors are produced when the collar die (the circular die surrounding the lower die) malfunctions. 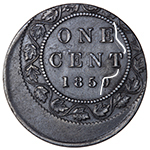 The collar die normally applies the edge device (reeded edge or plain edge) and prevents the metal of the coin from flowing outside of the confines of the die. When the collar is prevented from working properly during striking, it may rest below the surface of the anvil die. 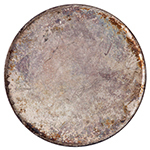 The resulting error coin with have a relatively normal appearance at the centre, but will have a diameter that is larger than a regular coin and the design will become distorted as it nears the periphery. Clipped planchets originate in the blanking process, when the metal discs are punched out from metal sheets. Occasionally a misfeed can occur where the strip of metal is not fed through the blanking machine far enough. When this happens, the punches strike an area of the strip which overlaps the hole left by the previous strike. The result is a blank with a piece missing. 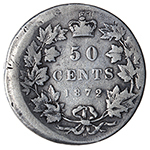 Most clipped planchet errors result in a coin with a curved piece missing. When a minting facility produces more than one type of coin, there is a small possibility that a coin can be struck on the wrong planchet. 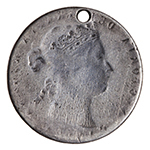 While every effort is taken to ensure the various planchets are not mixed, occasionally a coin can be struck on the wrong blank. Instances of this type of error have occurred on planchets of the wrong size, as well as planchets destined to be struck for other countries in facilities which produce coinage for various nations. 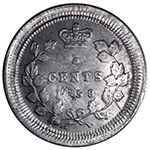 Brockage errors are produced when a struck coin is not ejected from the collar, and impresses onto another blank that hasn’t been struck. The resulting error has a raised design on one side, and the incuse design from the coin that sat underneath it on the other side. A die clash occurs when the coin dies come together with no planchet in between then, causing an imprint of each die on the opposing die. That impression in the die is then transferred to any struck coins, resulting in a die clash error. 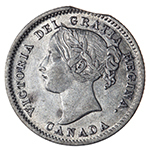 The white outline highlights the die clash impression of Queen Victoria's profile on the reverse side. This coin is also an example of an off-center strike.